We have the cover of The Death Save the Strawberry novel! Rukia, as we were predicting! She's so cute! Albeit so purple! Perhaps Sensei was hitting the cough syrup during his prolonged illness? We wish Kubo-sensei a full recovery. Kubo is listed first before Makoto-san as author on the cover. 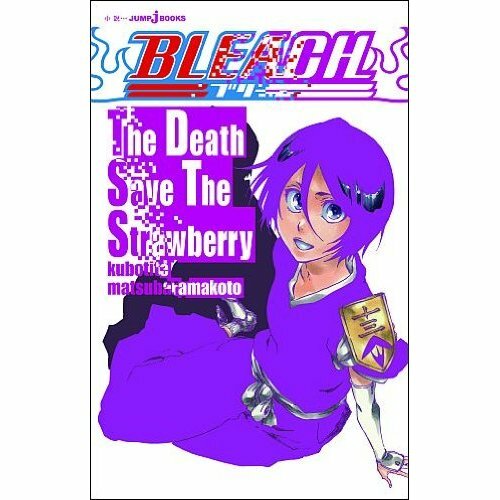 http://www.amazon.co.jp/BLEACH-Death-Save-Strawberry-BOOKS/dp/4087032728/ Kubo-sensei came up with the title, and the title made the editor cry. (Ah, Syn is now telling me that indeed it was Makoto-san who cried!) For more about the novel's contents, see translation by TruantPony here: http://deathberry.com/index.php?topic=404.msg20650#msg20650 The novel will cover the time period of those 17 months when Ichigo had no powers and follow the making of the sword which was to restore his shinigami powers. We've already had an excerpt translated in which we saw Rukia's hair-cutting scene! I can't wait for more! I think this novel will offer a unique perspective into Rukia. It's something she needs, since I feel that she's a little neglected in the manga. I love the slightly blinding violet, unexpected as it is. But I especially love how ADORABLE Rukia is. That smile! That relaxed pose! Super-cute. Thank you for sharing, ladies! Oh Rukia. If we can't have you in the Manga at least we can have you everywhere else! She looks beautiful as ever. I'm so glad we have people sharing this stuff with us. I don't even mind the intense violet. She just jumps at you and shocks you in an overly saturated punch of marvelous, radiant, purply HER. She is super dazzling and it has been a while I've seen her this cool and she is even smiling <333. Oh I like the purple. She was all purple in her last novel cover too--the Honey Dish Rhapsody where she was against that backdrop of the moon and wearing the dress Ishida made for her. She looked pensive there--here she just looks SO CUTE. It's a livelier piece--Sensei's drawing her cuter lately, I can't put my finger on it but she looks squishable! That last manga panel of her (before she went skull horror, lol)--she was so youngish and lively and PRECIOUS. Wow, my eyes! Too purple, but she does look cute,though. Purple is one of Sensei's colour themes for Rukia, along with White. It's no surprising that she is tinted purple in this picture as a result.